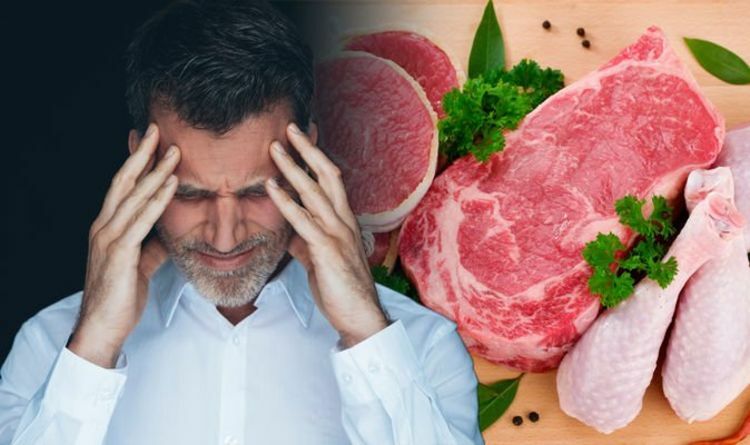 Vitamin B12 deficiency causes the body to produce abnormally large red blood cells that can’t function properly, which can then lead to complications such as vision problems and damage to parts of the nervous system. Some people can develop vitamin B12 deficiency as a result of not getting enough vitamin B12 from their diet. But how can you tell if you’re not getting enough? Vitamin B12 deficiency can cause a wide range of symptoms which can develop gradually or get worse as the condition goes untreated. Five symptoms experts at Healthline note are fatigue, pins and needles, mouth ulcers, jaundice and blurry vision. Fatigue can occur if your body lacks vitamin B12 and doesn’t have enough red blood cells to transport oxygen through the body. One of the long-term effects of vitamin B12 deficiency is nerve damage. It explains: “Vitamin B12 is an important contributor to the metabolic pathway that produces the fatty substance myelin. Myelin surrounds your nerves as a form of protection and insulation. “Without B12, myelin is produced differently, and your nervous system isn’t able to function properly. Some people with vitamin B12 deficiency may experience oral symptoms such as mouth ulcers. The health site cites a study which demonstrates this – ‘Glossitis with linear lesions: an early sign of vitamin b12 deficiency’. Vitamin B12 deficiency can often cause pale skin or a sight yellow tinge to the skin and white of the eyes – a condition known as jaundice. Vitamin B12 deficiency can be avoided by making sure you get your daily recommended intake of vitamin B12. Here are five foods you could include in your diet to help keep the condition at bay.